Wondering what you need to do to get great skin? Then you'll want to meet Christy Ledford, our wonderful Medical Aesthetician and Laser Technician. If you haven't met Christy yet, you are in for a real treat. Charming, professional and kind, Christy demonstrates a sincere interest in the well-being of our patients and the overall results of their treatments. She is quickly becoming a favorite of patients and staff. 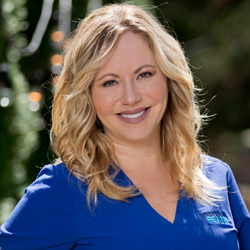 Her 13 years experience as a Licensed Aesthetician have given Christy an extensive understanding of medical-grade skin care products and procedures. Helping patients design their perfect, personalized skin care plan is Christy's specialty. She has a talent for finding just the right mix of treatments to achieve great results. Her extensive knowledge in combating aging, hyperpigmentation, redness and acne is what sets her apart. Dr. Reath is a true believer in aesthetic skin care and the impact it can have on our surgical procedures. Together, Christy and Dr. Reath stay up to date on the newest technologies and ingredients to give the best results to our patients. Whatever your unique concerns, skin type and budget, you'll love your time with Christy almost as much as you'll love your results. "I look forward to building new relationships with Dr. Reath's patients and staff. I can't wait to help patients see exceptional results as we achieve their skin care goals together."